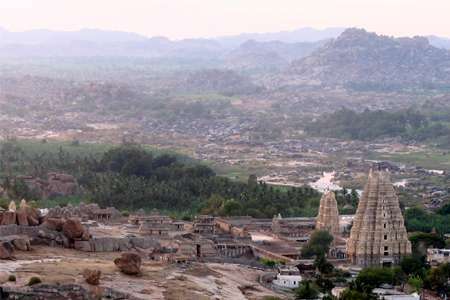 A strange and magical place, Hampi is one of the most beautiful towns in Karnataka. Huge boulders are scattered across the land where ruins of the old Vijayanagar capital stand, poignant reminders of the passage of history. The archeological ruins are a UNESCO World Heritage site. This windswept little village was once the centre of a vibrant, thriving culture that enriched the entire region with carved temples and rock-cut magnificence. The brothers Harihara and Bukka established the Vijayanagar Empire in 1336. In an age when the powerful Mughal army of the north was stamping its authority on almost the entire subcontinent, this southern Hindu kingdom proved too difficult to crack. In 1509-29 during the reign of Krishnadevaraya the empire reached the pinnacle of its influence economically, militarily and culturally, the legacy of which abides till date. In 1565 the end came swiftly. 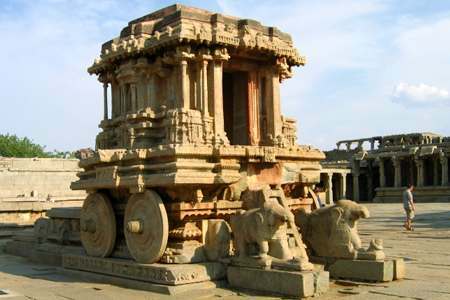 Unable to withstand the combined assault of the neighbouring Muslim kingdoms, Hampi fell at the battle of Talikota. From then it was only a matter of time before the conquering forces made rapid inroads into the rest of the empire. Hampi Bazaar has almost returned to former glory with the old buildings being functional again. Traders once more ply their wares but now its mostly branded, packaged, with ‘sales tax extra’! This area has a charm of its own and much of it has to do with the fascinating phenomenon of renaissance. 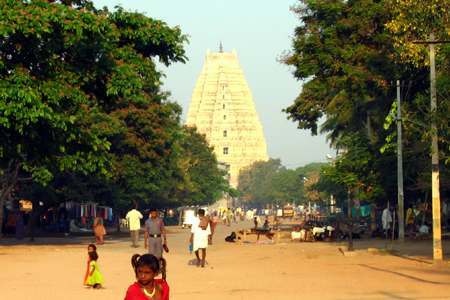 The Virupaksha Temple dedicated to an incarnation of Lord Shiva stands at the western end of the market just as it had 600 years ago. The main tower is over 50 meters tall. The Vittalla Temple at the eastern end of the bazaar is the undisputed best-structure in Hampi. This superbly sculptured temple was begun in 1509 during the reign of the greatest Vijaynagar king, Krishnadevaraya. Now a World Heritage Site, this temple, which was never completed or consecrated, encompasses the best of Vijaynagar temple building. At the entrance is lavishly carved stone chariot with an image of the mythological bird Garuda. The pillars of the hall are musical, if struck they’ll sound a definite musical note. Near Sule Bazaar is another ancient temple called the Achyutaraya Temple. Beautifully sculptured, it too has a strange aura that evokes a sense of the past. And then there are the ruined remains of the grand palace complex from where at one time royal decrees must have issued forth commanding respect and obedience from the subjects. 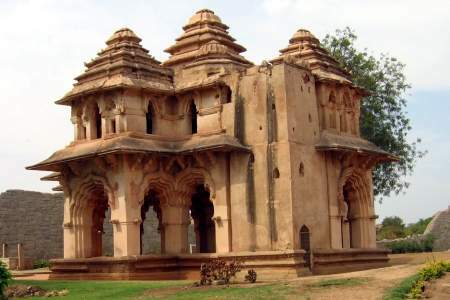 The Royal Centre is one of the most hauntingly fine structures in Hampi. The Lotus Mahal and the Elephant Astabal (Stables) lie inside the Zenana Enclosure. These were private quarters that held the royal womenfolk away from prying eyes. All the buildings are an exotic mix of Hindu and Islamic styles and the result is high vaulted domes and striking carvings. The Royal Enclosure has an array of temples and houses the old waterworks. 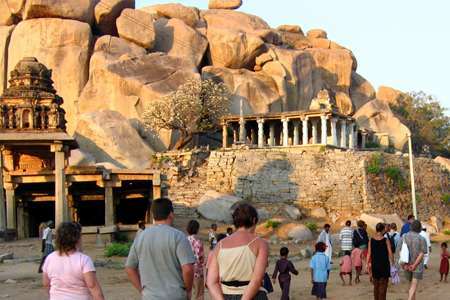 Across the Tungabhadra, in Anegondi, is another complex of ruins that has many small temples.